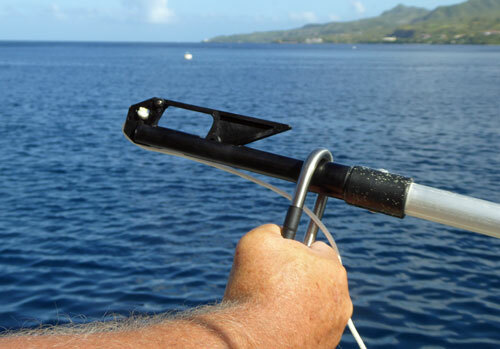 Some mooring buoys have small pick-up buoys attached which you can scoop aboard quickly with a standard boat hook. 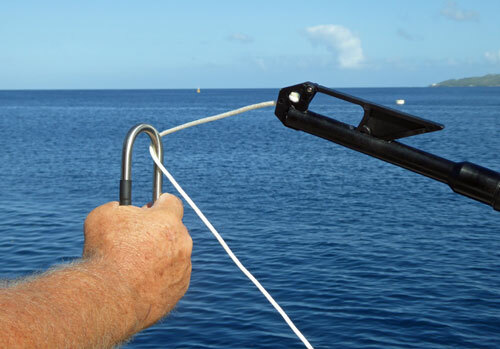 Others are not so convenient, requiring that you thread your mooring line through the ring that's fixed to the top of it. You need to be able to do it swiftly and easily - and to save embarrassment - get it right first time. And that's what the EasyMoor was designed to do. The first thing that surprised me about the EasyMoor is its small size. The second, it didn't come with its own pole - which is a clever idea, as it enables them to be shipped worldwide for very little cost. Mine was mailed to me in a padded envelope. I was delighted by this as I've already got one of these telescopic poles aboard Alacazam which I find very useful at antifouling time, first with a swivel headed sanding block and then with a paint roller. Why pay for another pole that you don't need? It's good to have boating gear aboard that has multiple uses. But how does the EasyMoor work? It wasn't at all obvious initially and I really needed to understand this and get a bit of practice in before I started to use it in earnest. Taking pics of the EasyMoor in action on an real live mooring buoy from Alacazam's foredeck proved beyond my photographic (and acrobatic) expertise. But it works exactly as shown in these pics. 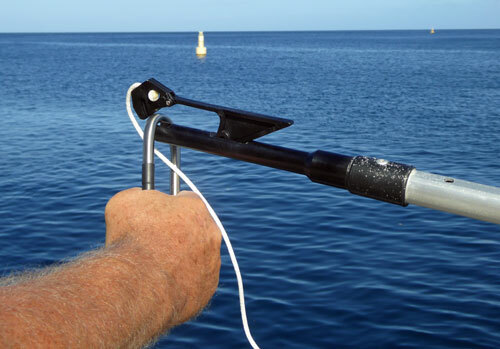 First attach your mooring line to the EasyMoor's messenger line and poke the EasyMoor through the ring atop the mooring buoy. Pull it back so that the first latch engages the ring. Note that the messenger line is already through the ring. The first latch closes and the ring is captured within the EasyMoor. Keep pulling and the second latch disengages and releases the EasyMoor from the ring. You've now threaded the messenger line through the ring. Keep pulling and your attached mooring line will follow. This entire process happens in seconds. 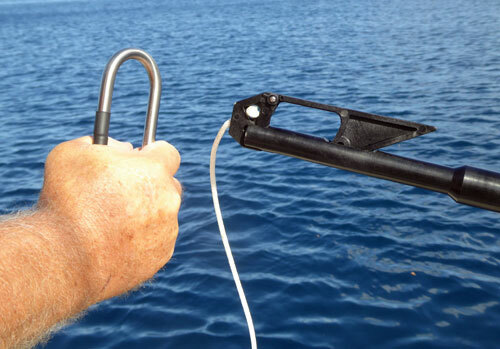 The mooring devices I've had before all required that you latched the device to the mooring ring by pushing it forward onto the mooring ring - not always easy when the mooring buoy is already moving away from you. The EasyMoor is different - you push it into the mooring ring (being so small this is really easy) and latch it onto the ring by pulling it back towards you - a much easier and slicker process. 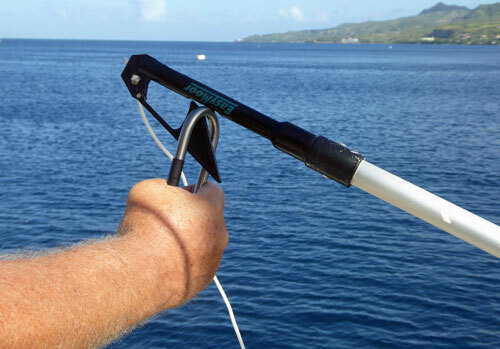 And unlike many other mooring devices you don't need to hold on to the line to keep the latching mechanism cocked. With EasyMoor you can use one hand to hold the stick and the other to make the "forward a bit, left a bit, starboard a bit, stop!" hand signals to the helm, or to hang on to the boat. Use the EasyMoor upside-down for small rings and in situations where it's awkward to poke it through the ring. 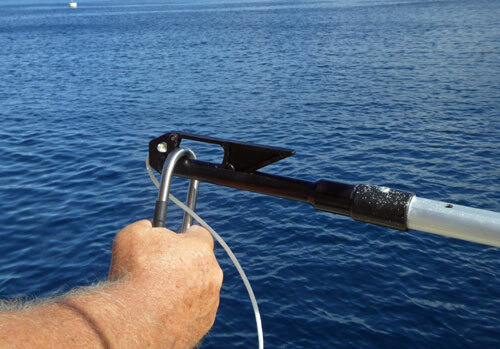 Some mooring buoys have an infuriatingly small ring which rule out the use of most mooring devices. I found the EasyMoor will tackle these with ease. Don't try and poke it through the ring - just use it upside down as shown here and pull the angled part of the latch over the ring. You'll find that it will thread the messenger line through the ring exactly as before. 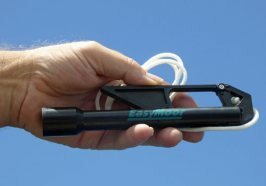 The EasyMoor is a useful item of boating gear to have aboard - it is quick and easy to use. 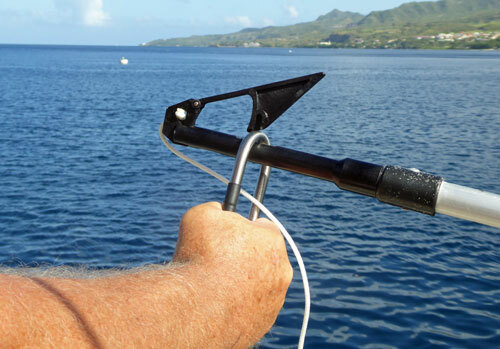 It will be my first choice of mooring device when I need to attach Alacazam to one of the increasing number of mooring buoys that are being placed throughout the Windward and Leeward Island anchorages of the Caribbean.